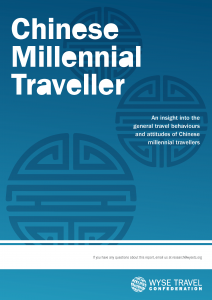 Today marks the launch of WYSE Travel Confederation’s Chinese Millennial Traveller report, which provides a unique insight into the habits, spending, satisfaction levels and travel styles of Chinese travellers born between the early 1980s and 2000s. Part of the Millennial Traveller report series which surveyed more than 7,600 travellers from over 100 countries, the Chinese Millennial Traveller report looks at the responses from more than 1,600 Chinese young people. According to UNWTO data, Chinese travellers took an estimated 109 million overseas trips in 2014. In addition, overall expenditure in 2013 reached USD 129 billion making China the world’s largest outbound market. In order to support youth and student travel industry professionals serving the Chinese tourism market, the Chinese Millennial Traveller report is free to WYSE Travel Confederation members. If you are not a member download our FREE executive summary, or purchase the full report for EUR 99,95. The majority carry debit cards when they travel, but they prefer to pay with cash than with debit card or credit card. Their top concerns are the economy, social inequality, and education. If you’re not a member, download our FREE executive summary, or purchase the full report for just EUR 99.95.